There are certainly more solid parts per million in my breakfast French press than in a bowl of miso broth. But, coffee isn’t broth, no matter how thick, and so miso remains the simplest, most energizing soup I know. The traditional base for miso soup is dashi, which is made from bonito (flaked dried fish) and seaweed. Its flavor is delicate and delicious. Aveline Kushi writes that, ideally, soup does contain both sea vegetables and either miso or tamari, “which simulate the salty composition of the ocean from which primitive life evolved.” (Aveline Kushi’s Complete Guide to Macrobiotic Cooking for Health, Harmony, and Peace). Don’t let dashi-making deter you, though. Use good unpasteurized miso (typically sold in 4- to 16 oz. tubs or jars from refrigerated cases in health food stores) to turn even plain water into a satisfying soup. Ryan taught me the best way. My cookbooks have recipes for batches of four or more helpings, but if you’re cooking for one or two it’s better to soup miso by the bowl. Made with rough and aged South River miso, this broth is the most satisfying light meal there is. Serve it with thick bread or brown rice. 1. Put the miso in your soup bowl and mix in a little warm water to soften it. Gradually add more water until the miso is the texture of mustard. (This should take less than 1/4 cup water). 2. Add hot water, a few moments off the boil; use as much water as you want soup. Stir the diluted miso and the water together and top with sliced scallions. Note: The amount of miso depends on your taste, the type of miso you are using, and the amount of water. Only experimentation will determine the amount you’ll like best. Besides making a meal on its own, miso is good for seasoning any soupy dish or broth you have. We mixed miso into the seitan cooking water last week at cooking club. The seitan was cooked in broth seasoned with tamari and dulse, tasting like the sea, and just a couple of teaspoons of chickpea miso made it into soup. Soften miso as for soup, and add it to cooked beans for a savory treat. Miso may also be diluted and poured over greens or other vegetables as they cook, although it is best not to boil miso if you can help it. When miso boils, the flavor doesn’t change but the living ferment is destroyed. Consider the saltiness of miso when seasoning with it. Some dishes may require both sea salt and miso for the proper flavor, while others will taste just right with only miso. Try some of your miso plain or on a slice of toast to find out just how salty it is. The reason for diluting miso with a little of the water before adding it to soupy dishes is, if you do not dilute the miso it stays lumpy. The Sous Chef at Pure Food & Wine used to add wads of hatcho (soybean) miso to family meal soups, for heartiness. He did not temper the miso, though, so the soup was mostly bland but with biggish lumps of concentrated salty flavor in a few of our bowls. Barry, Kim, Laura, Emily, Miles, Ryan and Hilary cooked it off. I am still trying to develop a stance on the use of nightshade vegetables. As far as I can tell, the nightshade vegetables (eggplants, potatoes, tomatoes and all kinds of peppers) are the least poisonous parts of a large family of toxic plants. You will almost certainly not get sick from eating a potato or two, but I do believe in the potential of nightshade vegetables to have a mild and cumulative effect on health. Plants in the nightshade (Solanaceae) family contain the alkaloid nicotine as well as the glycoalkaloid solanine. Solanine is reported to, among other things, contribute to arthritis and reduce calcium absorption or leech calcium from the body. Nicotine (the drug in cigarettes–tobacco is also in the nightshade family) is clearly not desirable to someone following a strict macrobiotic diet. However, there are just as many reasons why you should include the nightshades in your diet. Potatoes, for example, have been a staple food for thousands of years, and Colorado grown potatoes are abundantly available most of the year. Therefore, while you may not feel it necessary to avoid nightshade vegetables altogether, it is important to be aware of them when planning a macrobiotic meal or menu. Despite their classification as nightshade vegetables, we enjoyed the strong taste of these crunchy pickled peppers stuffed with soft, salty olives and capers. Perhaps they fueled the cockrings conversation! Make a slice, lengthwise, down one side only of each pickled pepper. Leave the stems on. 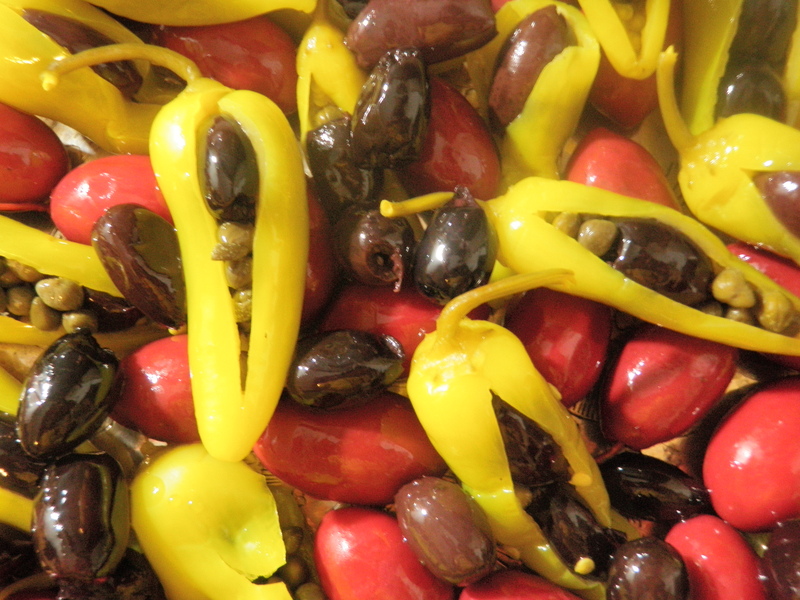 Shake out any pickling juice that may be caught in the pepper, and stuff each pepper with the pitted Kalamata olives. One to three olives per pepper. Add capers to some or all of the olive-stuffed peppers. Arrange the peppers with the Alfonso olives and any remaining Kalamata olives on a serving tray and get after them while the dinner simmers. Birds like it raw, but millet is one grain that I typically toast in the pan before adding water to steam it. The cooked millet comes out very fluffy, quite dry and not as sweet as rice. Millet and winter squash are a classic combination. If you become interested in cooking with millet, you will want to experiment with many variations on Aveline Kushi’s Millet and Squash Loaf, in which diced winter squash is cooked with the Basic Millet and the mixture is then transferred to a covered baking dish and baked in the oven into a firm, slice-able but crumbly loaf which you can toast like bread. I suspect Souen’s ‘Cornbread’ is actually more technically something of a millet loaf with whole kernels of corn added to give the illusion that more corn’s involved. Rinse the millet well using your favorite method for rinsing small irritating grains. I like to rinse mine in the cooking pot to minimize dirty dishes. Place the rinsed and drained millet in the cooking pot over medium heat and stir continuously until it dries out and toasts to a golden color. Be careful it doesn’t burn around the edges of the pan where you aren’t stirring thoroughly enough. Turn down the heat if it does start to burn. Add the water (any temperature) and salt to the toasted millet and bring to the boil over high heat. Cover the pot with a tight fitting lid, lower the heat as far as it will go without turning off and cook undisturbed for half an hour. Off the heat and allow the millet to sit, still covered, for 5-10 minutes before serving. Well worth the time we waited for the Yellow Split Pea Dahl that it replaced. Red lentils cook so quickly. Maybe they will be done in less than half an hour. Rinse the lentils and set them aside. Heat a little bit of oil in the dahl pot and saute the onion, adding the celery and ginger after a few minutes and cooking until all of the vegetables are tender. Add the lentils and water to the pot and bring to boiling, then reduce heat and simmer, covered until the lentils are cooked to a soft, smooth puree. Beating them with the wooden spoon helps to smooth the dahl near the end. Once the lentils are soft, season to taste with the shoyu. Start with maybe 2-3 Tablespoons and increase as needed. Top each bowl of dahl with a few slices of scallion. It sounds attractive. Once you soak the seaweed it gets slimy and slippery and is not so easy to make look good. Cutting the carrots into thinner pieces makes it easier to tie the seaweed around them but sacrifices the simplicity of plain round carrots. Two things might satisfy the high hopes I had for this dish: wrapping the carrots in wakame (a thinner seaweed than kombu), and, tying them with the dried gourd strips as Aveline Kushi recommended in the original recipe for Carrot Kombu Rolls. This whole recipe is easier said than done. Soak the kombu in water until it is pliable and easy to slice. Cut the carrots into manageable lengths. 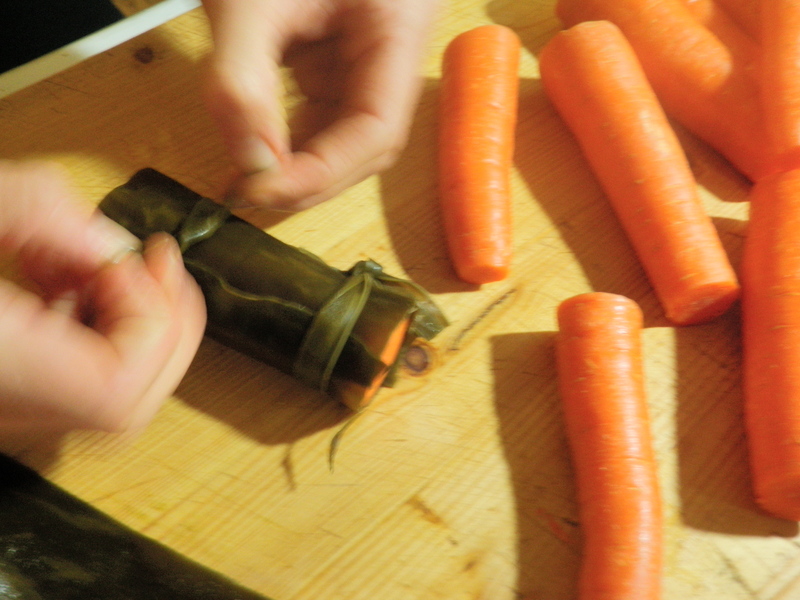 Wrap kombu around the carrots and secure it with more kombu, cut into thin strips for tying. There very well may be carrots left over after all of the kombu is used. Put the plain carrots, the wrapped carrots and the seaweed soaking water into a cooking pot with enough additional water to cover all of the carrots. Simmer, covered until the carrots and kombu are tender. Save the cooking water; you can make it into miso soup. Another winning dessert from Aveline Kushi’s cookbook. Did she mistakenly title the breakfast foods chapter as desserts? The topping tastes like granola. We were not quite sure what kind of rolled grain was in Mother’s cupboard but it turned out good! 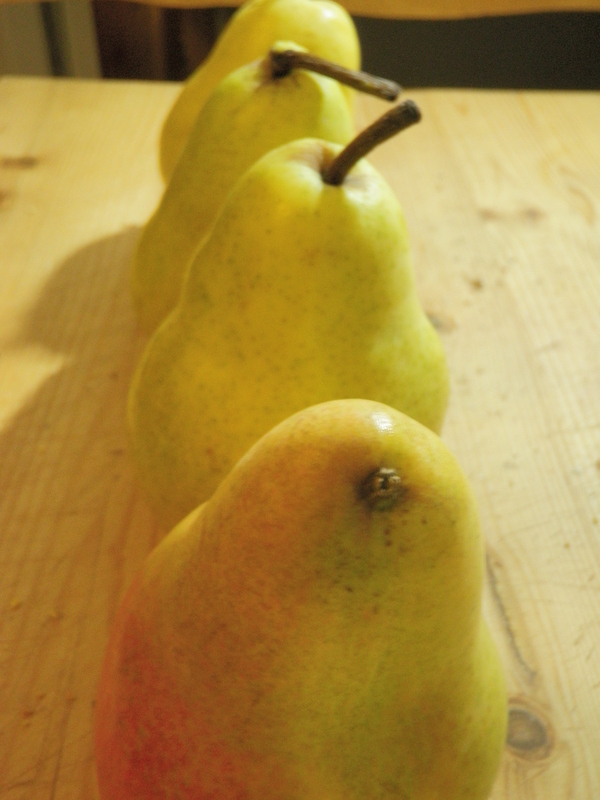 It is important to only use 5 pears in the recipe so that everyone can have a taste of the sixth pear raw. Grease a baking dish with canola oil and heat the oven up to 375 degrees. Toast the walnuts and the grain flakes, separately, in a small skillet on the stove top. Stir them often or continuously so that they do not burn. Set them aside to cool a bit while you prepare the pears. Combine the arrowroot, salt and water in a bowl and toss the 5 sliced or chopped pears in that. Spread the coated pears into an even layer in the prepared baking dish. Chop the walnuts and combine them with the grains and the rice syrup to make a crumbly mixture. Distribute the crumb dough evenly over the pears in the baking dish. Cover the dish and bake 20 minutes. Bake 5-10 minutes more once you remove the cover in order to brown and crisp the top. We accompanied this meal with fresh Spiced Apple Cider that Emily and Miles brought, red and white wine and beer. Laura, Ryan and Hilary joined by Barry, Kim, Emily and Miles. Beans simmering, Emily slicing carrots and all of us wondering how long until it’s done. We should have started sooner. A double batch of Aveline Kushi’s recipe. Try allowing 3 or more hours to make a really soft-beaned soup. By Mother. We all secretly wanted the last one.